This mens gold pocket watch from Rotary with champagne coloured dial and gold roman numerals is beautifully made and finished off with a half hunter design. From the picture you can see the mechanical detailing and gold numerals really make this watch look impressive and with it being made by Rotary you can be sure that you are buying a well known make that you can trust due to its name and the heritage associated with it. Its half hunter design is perfect for those who wish to use it on a regular or even daily basis as the over gives plenty of protection to the watch face itself whilst still allowing the time to be read through the hole in the front cover. A beautifully crafted timepiece in gold this pocket watch would make an ideal gift perhaps for a wedding present or anniversary. A classic mechanical half hunter pocket watch from Rotary. Featuring a gold plated stainless steel case, Albert chain, mineral glass and champagne coloured dial with gold roman numerals which finish things off nicely. This mens silver pocket watch from Rotary with skeleton dial and roman numerals is finished in a mechanical style with an open face design. From the picture you can see the detailed mechanical design really sets this timepiece apart from the rest and with it being made by Rotary you can be sure that you are buying a well known make that you can trust. Its open face design helps leave its best features on display for all to see and with this design the time can be read without having to remove any obstructions that are found with full hunter style pocket watches with covers over the watch face display. A classic mechanical pocket watch from Rotary. Featuring a stainless steel case, Albert chain, mineral glass and skeleton dial. With Roman numerals. The Lincoln from Stauer is a gold pocket watch with a full hunter design. 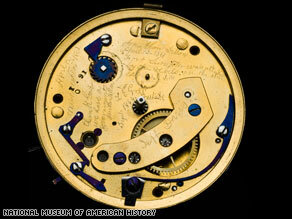 The watch takes its name as it is based on the pocket watch owned by Abraham Lincoln. The original watch owned by Abraham Lincoln was featured heavily in the news last year following the discover of a secret message left by a watch repairer called Jonathan Dillon, the message read Jonathan Dillon April 13-1861, Fort Sumpter was attacked by the rebels on the above date J Dillon, April 13-1861, Washington, thank God we have a government, Jonth Dillon. The watch itself is made by The George Chatterton Company who have painstakingly recreated the design of the dial and position of the small second hand and they have even replicated the mysterious engraving on the back of the piece. Anyone interested in either American history or Abraham Lincoln will treasure this piece of workmanship. The movement employs vintage styled manual winding with 20 jewels and the case is 14k gold fused which aims to match the colour of the original exactly which can be found at Smithsonian’s Museum of American History. Now over 200 years since the iconic Americans birth the fascination of Lincoln still lives on. The George Chatterton Watch Company has set a strict limited edition and Stauer is the only place that you can find this piece of history meaning that this will over time become a collectors item for sure. The George Chatterton Watch Company Lincoln pocket watch is available only from Stauer and in limited numbers – click here to buy or for more information. This pocket watch from Sekonda is a gents style pocket watch with White Arabic Dial, Stainless Steel Case and Chain and Quartz Movement. Priced under £30 this item is at the lower price range of pocket watches although looking at it you would not think so.